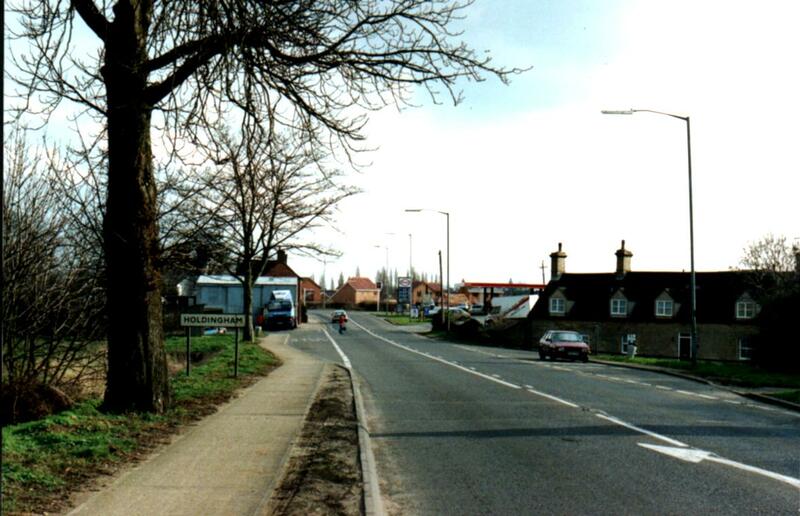 This is a hamlet of New Sleaford lying one and a half miles northward of it on the road to Lincoln. Its name was originally spelt Haldingham which is not mentioned in the Domesday Book, nor in Testa de Nevill, perhaps because it always constituted an adjunct of Sleaford (ancient name Lafford); and the first we hear of it, is as a portion of the Bishop of Lincoln's manor of Sleaford. It was, we may presume, the birthplace of Richard de Haldingham circa 1250-60, the author of a very early and curious map of the World, The Mappa Mundi drawn on a single large piece of parchment or velum (calf skin) measuring 64 inches by 54 inches and is the only complete surviving example of a medieval wall-map. It is now in good condition after expert repair and is preserved in Hereford Cathedral. No date appears on the map but evidence suggests that it was completed in about the year 1290. The author discloses his name at the lower left hand corner: 'Richard of Haldingham and Lafford' (i.e. Holdingham and Sleaford in Lincolnshire) who was prependary of Lincoln Cathedral and who resigned in 1283. He was appointed prebend of Norton in Hereford Cathedral in 1305. Next he was connected with the Chapter of Salisbury and finally became Archdeacon of Berkshire. Nothing is known of him after 1313 and it is probable that he died soon after bequesting his map to the Cathedral where it has remained ever since. 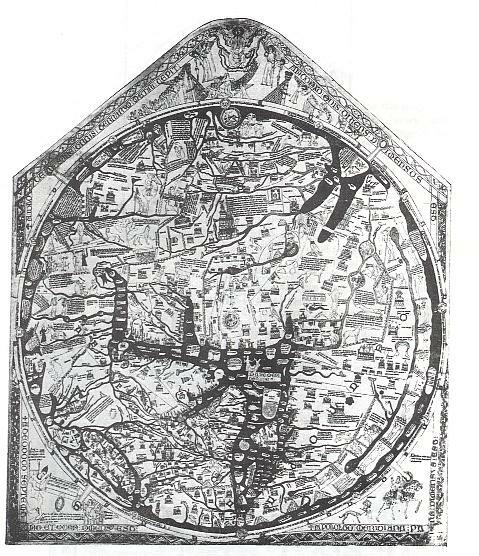 The map reveals how the 13th centuary scholars interpreted the World both geographically and spiritually. The next we hear of any person connected with this hamlet is in a deed of Bishop Oliver Sutton, by which, with the consent of the Dean and Chapter of Lincoln, he manumitted William Rauceby, of Holdingham, his bondsman, and confirmed to him 5 tofts and 2 oxgangs of land in Lafford and Holdingham, which he had previously held in villanage of the Bishops of Lincoln for a rent of 20s to be paid at the court of the manor of Lafford, and all secular services, customs, and demands for ever. This was dated and signed at Lincoln on the Thursday next after the feast of the Assumption, in 1287, and was confirmed by the King, at Waltham, on February 4th, 1332. After the Enclosure Act of 1791, Holdingham was enclosed circa 1794. Before then part of the hamlet at the angle between the Lincoln and Newark roads was called the Anna, a term possibly derived from Annachorage or Anchorage, marking the site of an ancient hermitage. On this was an enclosure surrounded by a fosse and the remains of an ancient building within it, now incorporated in the farm premises on its site. The Anna derivation from Anchorage may well be a dubious 19th century fantasy. The Anna is a piece of common pasture and may have derived from Hamma (pasture field). To an untrained eye there is no evidence at all of the supposed enclosure. In the 16th century there was a chapel here dedicated to the Virgin Mary, but how long it had then existed is unknown. This stood in the small pasture close bounded on the east and north by the Lincoln and Newark roads, and from a former examination of its site appears to have been 70 feet long and 30 feet wide. It had fallen into a ruinous state in Queen Marys reign, when inquisition was made into its condition, and its reparation ensued. It still existed in Holless time 1640, for he noted four armorial bearings painted on its windows, viz: those of Russell, Bishop of Lincoln, 1480-1495, Hussey, Berkley, and Markham. In front of the chapel by the roadside formerly stood the octagonal base of a cross; both having long since disappeared though according to Whites Directory of Lincolnshire published in 1842 the chapels foundations could still be seen. Holdingham was on an important long distance droveway, used by Scottish and Northern drovers to bring cattle south to market in East Anglia. In the 17th century and perhaps long before then there was quite a traffic through the village as a result. 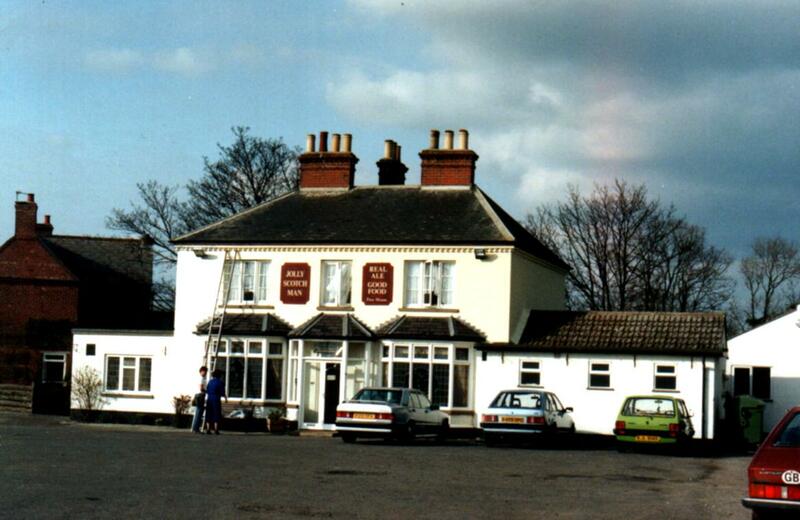 The local Inn no doubt partly catered for this as would have the village stream which is parallel to the original main droveway through Holdingham and made a convenient watering place for the animals as they were driven through. The present main road passes north-south through Holdingham, whereas the orientation of the hamlet (east-west) respects the position of this drove road. The Manor of Holdingham, which has an area of about 1360 acres covers the hamlet of Holdingham in the parish of New Sleaford in the North Kesteven District of Lincolnshire. The Lordship is an ancient hereditary, feudal title, created for the crown and dates back to Saxon times before the Norman Conquest. The Manor of Holdingham is actually something of a misnomer, since Holdingham itself is and always has been a small hamlet. That is why there was only a chapel rather than a church there: the parish church is St. Denys, in Sleaford. The "technical" manorial position whereby the Lordship was assigned to Holdingham rather than Sleaford is at least partly the result of a twelfth century re-organisation undertaken by one of the Bishops of Lincoln, who were the Medieval Lords. Under this, the town of Sleaford itself was made a "borough" (in other words, free of all manorial dues to the Bishop). This area included the modern streets Northgate, Westgate, Eastgate and that part of Southgate north of the River Slea. The remainder of the earlier manor, together with all its open fields and the hamlet of Holdingham became the "Manor of Holdingham", effectively, the whole of the territory of Sleaford apart from the above streets. Its manorial centre was not in Holdingham at all but at Sleaford Castle, which was in the Soke of Sleaford (i.e. that part of the manor south of the borough). Because this re-organisation took place so early in the Middle Ages, there is very little to indicate what the place was like before that time. Clearly, however, there were two (2) settlements, Sleaford and Holdingham, sharing one territory and one field system. This is not especially unusual in fact the latest ideas on Anglo-Saxon settlements suggest it may have been quite normal. However, what is peculiar in this case is that Sleaford was (by later Saxon times, at least) easily the more important of the two places. The parish church, the river crossing, the market and the administrative centre for the district were all there. Yet the field system is clearly focused on Holdingham. It may well have been Holdingham that was the original manorial centre but that Sleaford grew into a more important place because its water mills ground the corn for the whole area by later Saxon times. Map of the world in Hereford Cathedral. Mappa Mundi by Richard de Haldingham & Lafford. MAPPA MUNDI - THE MAP OF THE WORLD. The Mappa Mundi in Hereford Cathedral is unique in Britain's heritage and is an outstanding treasure of the medieval age. It is the largest and most elaborate world map that has survived in its entirety since before the 15th century and presents an illuminating view of the world as it appeared to the knowledgeable and well read persons in 13th century England. The term 'Mappa Mundi' comes from the medieval latin words 'mappa' meaning "cloth or chart" and 'mundi' meaning "of the world". It is a 'Tripartite' or 'T-O' map where the 'T' shape represents the Mediterranean Sea and the 'O' the habitable world we see. The 'T' divides the circle into Europe and Africa with Asia at the upper most part of the map. This follows a rough geographic division but the land masses and areas of the coastline are adapted to fit the text and the drawings, the geography is only of secondary importance. The cities are represented according to their significance in the Bible with Jerusalem the largest city at the centre of the Earth depicted as a circular walled city. In Africa are shown the fauna known to the Europeans such as Leopards and Lions and the astonishing people thought to live there. The map was drawn on a piece of vellum prepared calf skin, measuring 64 x 54 inches and is supported by an oak frame with the actual map contained in a circle 52 inches in diameter. The majority of the writing and drawings were made in black ink with red and gold being used to emphasize detail. The rivers were painted blue and some of the seas might even have been painted green but have now faded to sepia. The Red Sea however was depicted in red. 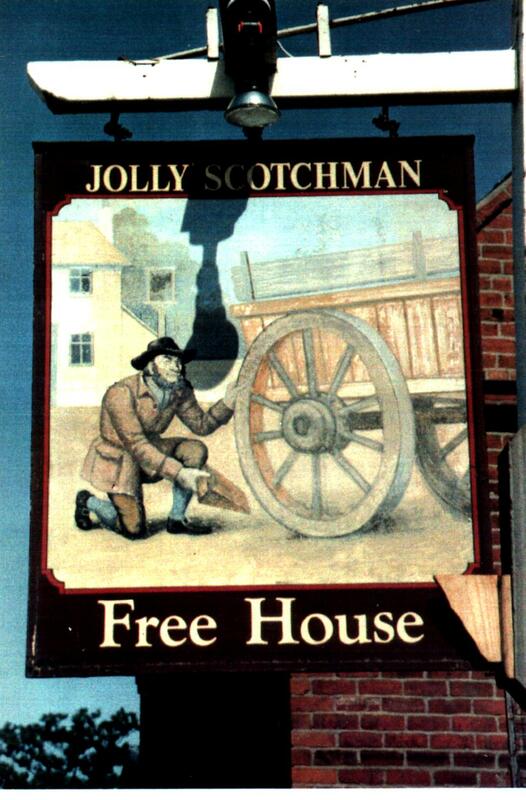 Inn sign outside Jolly Scotchman, Holdingham.